Super absorbent Wee Wee Pads are treated with a scent that attracts dogs when nature calls. The strong plastic lining on each pad prevents damage to floors and carpeting, keeping your house sanitary when accidents occur. And by using the pads as a training tool, housebreaking a puppy has never been easier. Pet owners simply train their dogs by moving the pads closer to the door, and eventually outside. 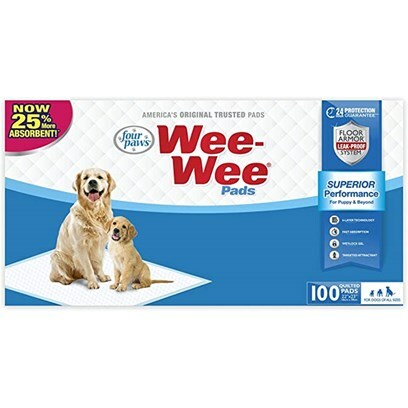 Wee Wee Pads can also be used on a regular basis for smaller housebound dogs, older pets with bladder control issues, and inside kennel cages. They are designed to do all the work, so you can simply toss them in the trash. Say hello to easy cleanup, and goodbye to pet messes! Contains no toxic materials and therefore safe to use. Made of a thin layer of absorbent paper-towel like material. To teach your puppy housebreaking habit, just place the Wee-Wee Pads with its plastic lining down on the floor near where puppy is usually kept. After practicing for a few days, puppies will readily learn to relieve themselves only on these pads. Once the indoor training is complete, keep moving the pad closer to the door so that the puppy can be trained outdoor too. It can be easily used outdoors even on breezy days by weighting the corners.